I remember when I was pregnant with my first. The CNM I hired worked at multiple hospitals, so my husband and I toured each one to get a feel for each hospital’s standard policies and procedures. A few people I knew questioned why we were bothering doing this since, aren’t all hospitals the same? While I was expecting some differences, I was really surprised with what I found. The standard procedures of the three hospitals we toured varied greatly – everything from the use of telemetry (wireless fetal) monitoring to how much bonding time a mom and baby were permitted before baby was whisked away for mandatory hospital procedures to where babies slept at night and whether babies were routinely given sugar water, formula or a pacifier. I came away realizing how important it is to carefully screen which hospital you chose as well as your OB/midwife and the L&D nurse who will be caring for you during your stay at the hospital. This June 22, 2009 press release illustrates ACOG’s (The American College of Obstetricians and Gynecologists’) efforts to help standardize the care women receive from OBs. Specifically, they wish to stabilize the variability in fetal heart rate interpretations which could considerably impact the frequency of the “fetal distress” diagnosis. EFM refers to external fetal monitoring which most women know as the belt laboring women wear that measures the baby’s heart rate and is connected to a machine which produces a strip of the baby’s heart rate as well as mom’s contractions. I found these quotes of particular interest (emphasis is mine). “Our goal with the ACOG guidelines was to define existing terminology and narrow definitions and categories so that everyone is on the same page,” says Dr. Macones. One of the problems with FHR tracings is the variability in how they’re interpreted by different people. The ACOG guidelines highlight a case in which four obstetricians examined 50 FHR tracings; they agreed in only 22% of the cases. Two months later, these four physicians reevaluated the same 50 FHR tracings, and they changed their interpretations on nearly one out of every five tracings. A meta-analysis study shows that although EFM reduced the risk of neonatal seizures, there is still an unrealistic expectation that a nonreassuring FHR can predict the risk of a baby being born with cerebral palsy. The false-positive rate of EFM for predicting cerebral palsy is greater than 99%. This means that out of 1,000 fetuses with nonreassuring readings, only one or two will actually develop cerebral palsy. The guidelines state that women in labor who have high-risk conditions such as preeclampsia, type 1 diabetes, or suspected fetal growth restriction should be monitored continuously during labor. Note that VBAC is not listed under “high-risk conditions” that “should be monitored continuously during labor.” Also, with a 99% false positive rate for cerebral palsy, I wonder about the rate of uterine rupture false positives. Here is the link, ACOG Refines Fetal Heart Rate Monitoring Guidelines. Do you have any advice on how to fight for manual/intermittent monitoring during a vbac? From what I understand vbac is not a condition that requires continuous monitoring yet all hospital procedures require continuous monitoring for vbacs. Yes, you can advocate to have intermittent monitoring, but it’s important to understand the risks and benefits of that decision. Yes, there are false positives with continuous external fetal monitoring. But, if you have a uterine rupture, the monitoring can make a difference in terms of outcomes. So there is a lot to consider here. I discuss monitoring in VBACs in great depth as well as how to advocate for yourself in my online workshop, “The Truth About VBAC for Families“. If you want to learn more, that is the fastest way to get to up speed on all things uterine rupture, VBAC, repeat cesarean, home birth, hospital birth, and your legal rights. And if you sign up with two friends, you can save 50% off of registration. Increíble Web .Sigue adelante con este excelente trabajo. Presenta un punto de vista realmente excelente sobre el tema y los mensajes son muy acertados. Seguramente tienes el mejor sitio de internet sobre el tema. Thank you! Oh yes I know about placenta accreta. I am in the situation where my first c-section was medically necessary (severe pre-eclampsia/beginning HELLP) but the hospital/OB was very anti-vbac, so I had to change both to find a vbac friendly environment, but my husband picked up from the previous environment that vbac’s are dangerous and my having to change doctors and hospital makes him nervous. 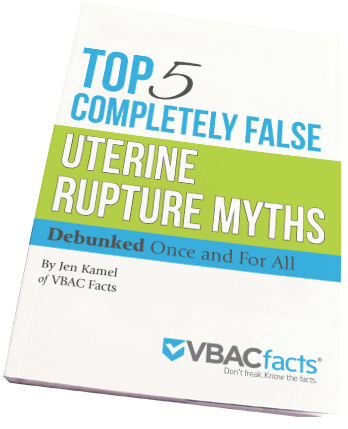 Outlining the risks of other things that can go wrong during any vaginal delivery makes uterine rupture not stand out so much as the worst thing in the world or a reason not to try for a vbac. I do have the NIH statement on hand, and also the Department of heath and human services evidence report which gathered the background evidence for the NIH conference – actually I didn’t see it on your resource website, so here that is as well (though I’m sure it’s in your stash somewhere!). I haven’t made it through the whole report yet (400 pages) but what I have read is really interesting. I thought I had found an article here about the rate of uterine rupture as compared to other obstetrical emergencies in tabular form to compare the rate and maternal and neonetal risk of each, but I am unable to find it now. Do you have that information? Thanks for the link update. ACOG updated their website a couple years ago so many of the older links I provide here no longer work. I believe the chart you are looking for can be found in an article written by two OBs protesting a VBAC ban at their local rural hospital. I’m sure you already know, but for the benefit of future readers, I want to point out that the incidence of obstetrical complications does not necessarily reflect the rates of infant or maternal morbidity/mortality. Take placeta accreta which I talk about quite a bit. The risk is very low for a first time mom (less than 0.5%), but increases with each subsequent cesarean. The risk of maternal mortality for accreta has been reported around 7-8%. That is significant. If you want the latest and greatest information on VBAC, I recommend you check out the Guise 2010 Evidence Report, the National Institutes of Health’s VBAC Statement, as well as the many presentation videos from the 2010 NIH VBAC Conference. You can access all of these resources here.